I bought 4 products from the collection that caught my eye the most, two I'd already used in the past and two that were completely new to me personally. The first new choice was the bath bomb Eyeball. 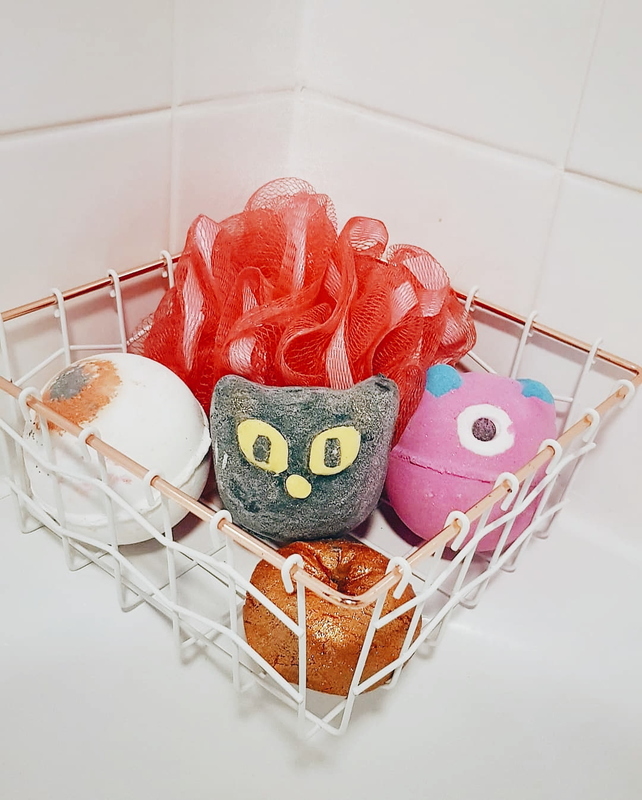 Eye spy with my little eye, a gentle rose and orange soak. Feast your eyes on this floral fizzer filled with ylang ylang and lavender oils and it’s peachy water. Usually I'm not a fan of floral scented products, bath or skincare, so I didn't have huge hopes for this but just had to get it for the pure spookiness of it. It was quite a strong scent with lavender and rose and left the water a gorgeous peachy colour that moisturised my skin and felt refreshing for an afternoon soak. The second product I hadn't tried before was the bubble bar Bewitched. 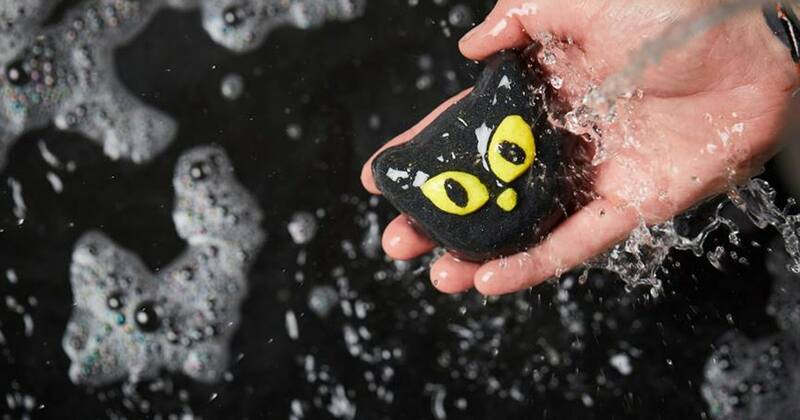 After a busy day whizzing around on a broomstick, run a bath, crumble this lucky little cat under the water and ground yourself with spicy olibanum. I know that this cute little cat has been in previous Halloween collections but I'd never picked it up before and was pleasantly surprised. I loved the blackberry and sultana scent and the way it turns your bath jet black is super Halloweeny so I'll definitely be rebuying this one. Warning: you may not want to destroy his little face. My favourite Lush product in general, beside Snow Fairy of course, is the Sparkly Pumpkin bubble bar. If you’re pumped for Halloween, you’re sure to feel jacked up by this sparkly bubble bar. Crumble your pumpkin up under running water to build a mountain of soft bubbles. I love this one because it's autumn in a sparkly bar. The citrus scent is lovely, it produces a mountain of bubbles as it describes and turns your water into a heavenly sparkly moisturising hug. A must have for everyone this Halloween. And lastly, another favourite of mine, the Monster's Ball bath bomb. You are invited to a specdracula event; get set to put a spell on all things that go bump in the night and boogie on down to your bathroom for a monster mash of uplifting oils. 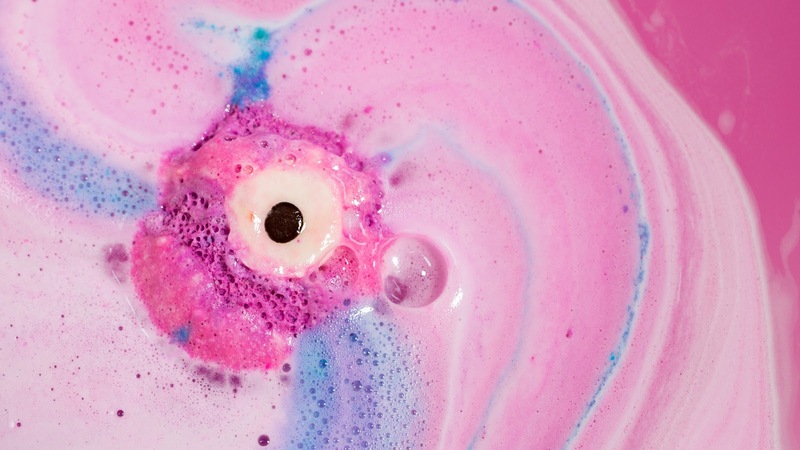 This produces the most beautiful concoction of pink, purple and blue colours in the water as it fizzes that reminds me of a girlier version of Intergalactic; then once it has settled down and you are in the bath, it transforms into the most gorgeous rich purple that sparkles and feels amazing on the skin. I adore the sweet scent and was so glad they didn't get rid of this like they did the Pumpkin bomb this year. What are your favourites from this years Halloween range? Or your favourite lush products in general? My daughters and I love Lush! We have a store near us. It always smells so great in there! I love the quality of their products as well! Wow! These look so awesome! I may have to go get some myself! I've personally never tried the Lush products but it looks to be very creative. I would buy these for my daughter because she loves things like this. Cute post! Hmm, never tried lush products. May just have to now. LOL. I completely missed this range somehow. The cat looks way too cute, love it!